Beets are a polarizing vegetable, with a significant number of people hating them, believing that they taste primarily like dirt. There are plenty of others though that love beets, specifically seeking them out on restaurant menus or at the grocery store. Beets are especially healthy and nutritious, making them a great choice for your diet. If you can only get past them tasting like dirt. It's probably not a surprise that I'm not a fan of beets. Yes, I believe they taste like dirt, and not in a good way. I enjoy earthiness in my wines, but I feel there is a different type of earthiness in beets, one that doesn't appeal to my palate. I don't enjoy beet salads, no matter what other ingredients are included in such a salad. And I'm definitely not alone in my opinion of beets. Could a chef find a way to get me to enjoy beets? The possibility exists, no matter how remote. Then, last week, that possibility became a reality. While dining at Committee, a Greek restaurant in the Fan Pier region, they always provide you with a complimentary meze, usually a special Dip of the Day with warm pita slices. Their Sun Dried Tomato & Feta Dip has long been one of my favorites. 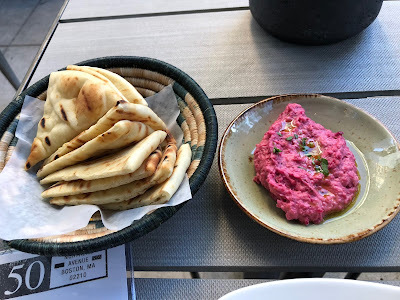 Last week, their complimentary meze was a Beet & Garlic dip, and I winced a little when it was brought to the table. I assumed I wouldn't enjoy it because it was made with beets. Dirt-tasting beets! However, I made the effort to taste it, to open my mind to the possibility that maybe I would like it. I did have high expectations but there were reasons to hold out a tiny bit of hope. First, I know the talent that Committee has in the kitchen, the culinary skills that transform ingredients into delicious and interesting dishes. As I've long said, a great chef can make me eat just about anything. Second, I wanted to be open, to be willing to at least try something new and different. I've often encouraged my readers to do the same, to be willing to eat or drink new things, to broaden their palates. So, I slathered some of the beet & garlic dip upon a slice of pita, and took a tentative bite. And then another, and then another. It actually was tasty, with more of an earthiness rather than a dirt taste. It was enhanced by the garlic, and there was even a hint of sweetness to the dip. I was enjoying something made with beets! I ate and savored a good portion of the dip, and have to give kudos to the Chef and kitchen staff at Committee for creating such a tasty little dish. When you go out to eat and drink, take chances. You never know where they might lead.